It took about five seconds from the time Siale Angilau grabbed a pen from his defense attorney's table for him to run across the federal courtroom floor and sail headfirst into the witness stand, where he was fatally shot by a USA marshal. The video then shows a deputy US Marshal, identified in court documents as Jane Doe, pull her gun from its holster and rapidly fire four shots at Angilau. The Justice Department maintained that the marshal who killed Angilau protected the courtroom that day, and that disclosing the video would further inflame gang members who had threatened retaliation against law enforcement after the shooting. "The video completely contradicts plaintiffs' argument that Angilau stopped posing a danger within less than one second of launching himself over the witness stand while making a stabbing motion with a pen in hand", Dowdell wrote, according to the Desert News. 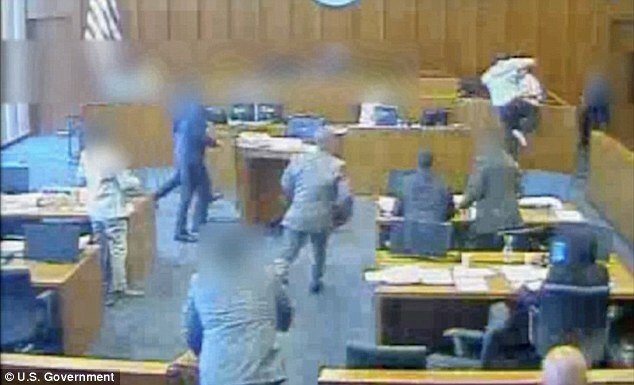 US District Judge John Dowdell chose to make the video public after he dismissed a lawsuit brought by Angilau's family claiming excessive force. Sykes claims because the witness got out of the way he wasn't in danger when the marshal opened fire. He also noted that the defendant was already on the ground when the Marshall fired the final three shots, CBS News also reported. "There was no need to use deadly force", Sykes said. Angilau was one of 17 Tongan Crip members named in a 2010 indictment accused of assault, conspiracy, robbery and weapons offenses. His family have not yet decided if they will appeal the judge's dismissal of their lawsuit. He was the last of the defendants to stand trial, with other gang members having received prison sentences ranging from 10 to 30 years. The family had been allowed to view the video, but not to release it. Before he died, the incident prompted US District Judge Tena Campbell, who was hearing the case, to declare a mistrial. In July 2016, the Utah Headliners Chapter of the Society of Professional Journalists and a coalition of Utah media, including the Deseret News, KSL, Salt Lake Tribune, Fox 13 and Associated Press, filed requests under the Freedom of Information Act seeking the video with the assistance of attorneys from Parr Brown Gee & Loveless.